KAMPALA – Already banned by the High Court from representing any entity against the defunct Crane Bank of city businessman Sudhir Ruparelia, closed by Bank of Uganda in October 2016 and later controversially sold to dfcu Bank, a blogger has placed renowned city advocate Mr. David Mpanga back into the controversy. 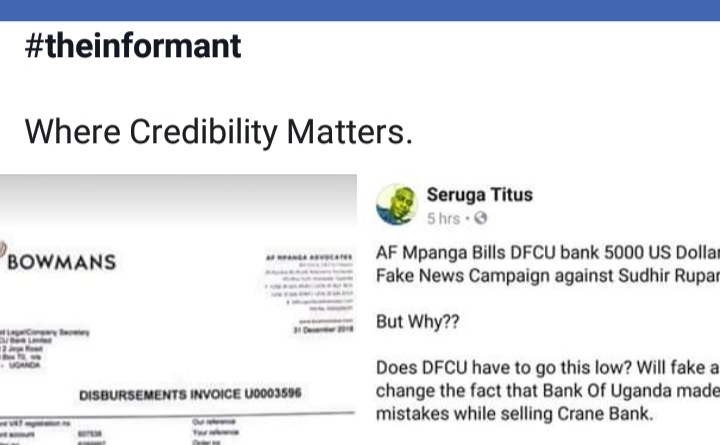 Mr Titus Seruga, who runs a no-holds-barred Facebook blog, says Mr Mpanga has billed the dfcu Bank some thousands of dollars to help them fight “fake news”. Mr Seruga produced an alleged invoice from Mr Mpanga’s Bowman’s Chambers to dfcu Bank legal manager, in blog posts over the weekend. 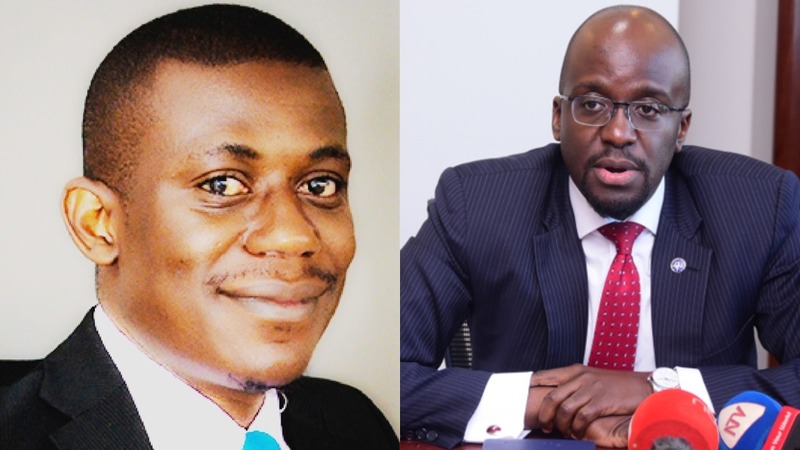 In December 2017, the Commercial Court disqualified Mr Mpanga, together with another city advocate Mr. Kanyererezi Masembe from the sh397b Crane Bank and Sudhir Ruparelia case against Bank of Uganda (BoU), citing conflict of interest. In his ruling delivered on December 21, 2017, the head of the commercial court division, Justice David Kutosi Wangutusi stated that Mr Mpanga of A.F. Mpanga Advocates and Timothy Masembe of MMAKS Advocates acted in violation of the Advocates (Professional Conduct) regulations. Section 4 of the regulations provides that an advocate shall not accept instructions from any person in respect of a contentious or non-contentious matter if the matter involves a former client and the advocate as a result of acting for the former client is aware of any facts which may be prejudicial to the client in that matter. The central bank in October 2016 closed Crane Bank, previously one of the best performing banks before controversially selling it dfcu Bank in January 2017 for a paltry Shs 200 billion. The central bank then sought to take Mr Sudhir and other directors to court, hiring the services of Mr Masembe and Mr Mpanga, but the city businessman protested saying that the two lawyers had represented Crane Bank and had conflict of interest. The Commercial court later stripped them naked, declaring them “conflicted”. The Parliamentary Committee on Commissions, Statutory Authorities and State Enterprises (Cosase) is currently conducting an inquiry into the conduct of Bank of Uganda and it’s officials in the closure of seven banks, with some like Crane Bank ending up in massive controversy. The MPs’ inquiry is also focusing on the mismanagement of closed banks by BoU after the Auditor General Mr John Muwanga issued a stinging criticism of the central bank in a special audit that cited massive flaws in the closure of Teefe Bank (1993), International Credit Bank Ltd (1998), Greenland Bank (1999), The Co-operative Bank (1999), National Bank of Commerce (2012), Global Trust Bank (2014) and the sale of Crane Bank Ltd (CBL) to dfcu (2016). The dfcu Bank has featured prominently in the inquiry and has sought to deflect the spotlight especially in the national and digital news coverage.